Three years after Linda Bolante says she was forced to resign from the Flagler County Sheriff’s Office, the former long-time finance director won a $200,000 settlement in a whistleblower lawsuit she’d filed against then-sheriff Jim Manfre in October 2014. Bolante claimed she was forced to resign because she raised ethical issues about Manfre’s conduct—issues that resulted in a series of ethics charges she filed against him in a separate action through the Florida Ethics Commission. Those charges resulted in a tortuous case against Manfre, a $6,200 fine from the Ethics Commission, and a public censure and reprimand by the governor. The ethics case’s outcome only strengthened Bolante’s hand in the whistleblower suit, as it provided the essence of her case with what amounted to the incontrovertible endorsement of a state agency and a governor’s executive order. With a new sheriff at the helm in Rick Staly—who was indirectly involved in Bolante’s firing when he was undersheriff: it was Staly who told her, on Manfre’s orders, that she had to resign or would be fired, though he assured her he’d ensure her retirement was protected—the sheriff’s office had less incentive to keep fighting the case. The sheriff’s office doesn’t even have an attorney currently. The Bolante case had been handled by Manfre’s attorney, Sid Nowell. Nor does the sheriff’s office have a finance director. The position had been filled by Cissy Burgess, who resigned at the end of January after Staly demoted her to budget and grant analyst. (Jeff Hoffman, the chief deputy under Manfre—and Burgess’s companion—was also demoted, and on March 4, resigned as well.) Strobridge said the department is close to hiring a finance director. Bolante was not among the applicants when the search was conducted statewide. 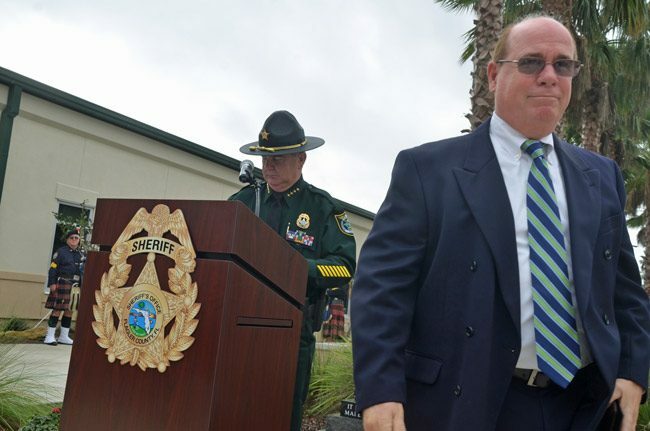 The settlement between the sheriff’s office and Bolante was signed just hours ago, at about 2 p.m., at the end of a nearly day-long mediation session in Jacksonville between Bolante’s lawyers and a lawyer for the Florida Sheriff’s Risk Management Fund. Just this morning in an appearance on WNZF radio, Staly spoke of current shortages. “I have a few vacancies, but it is an understaffed agency,” the sheriff said, “and I will be adjusting that with the county commission and the City of Palm Coast, which we have a contract with, to increase.” He said he wants to double the traffic unit, for example, from five to 10 cops. But that will prove more difficult this year: the sheriff’s office must pay $99,000 of the settlement before the end of the fiscal year, and another $21,000 by December, when the new fiscal year begins. “After a total risk assessment of continued litigation which included the potential of an adverse verdict, the additional financial burden to Flagler County, and upon the recommendation of the counsel of the Florida Sheriff’s Risk Management attorney’s, this case was settled,” a sheriff’s office release issued this afternoon stated. Bolante’s lawsuit closely dovetailed the charges she had filed at the Ethics Commission, such as what she called “unauthorized” spending by the sheriff, using an agency credit card and the use of an agency vehicle for personal travel. Manfre had battled the allegations as he had the ethics case, though his position weakened after agreeing to the ethics settlement. Bolante had worked at the sheriff’s office from July 2000 through March 31, 2014, her first four years under Manfre’s first administration. She answered to Manfre and Staly in her last two years of work there. The ethics case and lawsuit she filed against Manfre were largely instrumental in leading to his defeat last year—in the Democratic primary, before he had a chance to face Staly in the general election. Manfre, who was out of town, could not be reached Friday afternoon. sickened by this.. The man in Flagler wasn’t as concerned about money as the ethics of the situation. Manfre STILL costing us $$$$. I ma outraged by the fact that “we the people” are once again left holding the bag for the actions of a corrupt elected official? Manfre broke the law, she did what was legally required of her as a county employee, she gets fired illegally and now we have to pay the price while Manfre ‘could not be reached’ for comment. Is there no process for the county to recoup this money from Manfre directly? Manfre walks away with a smirk on his face and a nice pension paid by the taxpayers knowing he will not be liable for a cent of the judgement against his wrong-doings. A real class act. And none of this begins to address the moral, morale and financial messes he left in the Sheriff’s office. They’re elected officials, they have no shame. How much more is there that we the people don’t know about because workers don’t always file suit. I agree that Manfre should be paying out of pocket…this is a result of his leadership. There is a lot more to answer your question. I am one of the privileged to get fired. I did not file a suit. I was lucky enough not to work under him a second time.